As you know, the association held it's final memorial service on 24th Nov 2018 in Westminster Cathedrel. A big thank you to everyone who made the journey to share the day with us. There is a brief write-up and some pictures here. This years annual Remembrance Service will take place in Westminster Abbey on Saturday 24th November at 11.15am. See the newsletter for more details. The latest newsletter has just been published here. George Knott the last UK survivor aged 94 sadly passed away on the 8th August. 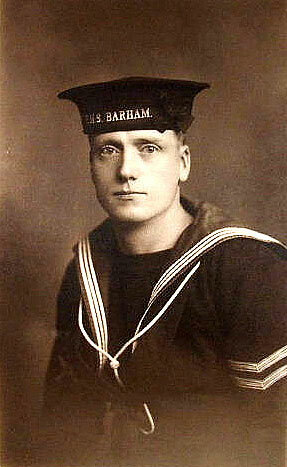 He was just 17, a Boy 2nd Class (the lowest of the low according to George) when HMS Barham was struck and sunk. He was on the mess deck having a tea break and got to the upper deck to slide down the side of the listing ship. The barnacles took the skin off his back. George served 23 years in the Royal Navy and became a chief Petty Officer. We thank him for his loyal service. May he rest in peace. on 7 September at Barham crematorium, Kent. This year our service was held on 25 November and was conducted by the Reverend Canon David Stanton. 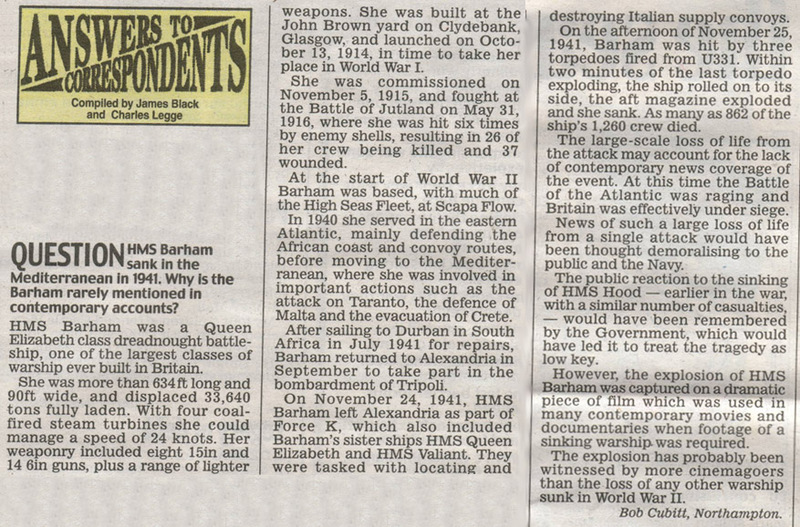 This was the 76rd anniversary of the sinking of HMS BARHAM. Michael Stratton-Brown laid the wreath on behalf of Survivors Jack Nealon and George Knott who both were present. As ever our beautiful wreath was made and donated by Patricia Picket assisted by her husband Alan who brought it to the Abbey. Many thanks yet again. Michael read the Tennyson poem “Crossing the bar”. 38 people attended our service and yet again for some it was their first attendance. It includes details of this months annual Remembrance Service that's taking place on 25th Nov in Westminster Abbey. It includes details of next months annual Remembrance Service that's taking place on 26th Nov in Westminster Abbey. The Associations chairman, Michael Stratton-Brown has written a brief history of the Barham in the Battle of Jutland. Please follow this link to read. This years memorial service will take place in Westminster Abbey on Saturday 28th November 2015. Guests are being advised to enter via the West door no later than 2.30pm. After Evensong, guests will retire to the nave for our annual service to remember those members past and present. More details are available in the Autumn newsletter. A brief write-up on our recent Memorial Service held in Westminster Abbey can be found here. The September newsletter has been published here. It includes details of next months Remembrance Service that's taking place on 22nd Nov in Westminster Abbey. Our 2013 Remembrance Service was held on St Andrew's day and attended by 74 people. The service was conducted by the Reverend Canon David Stanton, the new Canon Treasurer. Survivor Jack Nealon supported by his grandson laid the wreath on the 72nd anniversary of the sinking of HMS BARHAM. Survivor George Knott also attended in a wheel chair having discharged himself from hospital the day before. As ever our beautiful wreath was made and donated by Patricia Picket assisted by her husband Alan who brought it to the Abbey. Many thanks yet again. Association Chairman Michael Stratton-Brown read the Tennyson poem "Crossing the bar". The service takes place this Saturday (30th November) in Westminster Abbey. The Reverend Canon David Stanton, the new Canon Treasurer, will take the service. The abbey staff have said that Association members will be seated in the Nave until the choir practice have finished. They will then be taken up to the lantern for seating for evensong. Once everyone has left evensong, the Association will process back into the nave for the wreath laying. You may find it easier to enter the Abbey before the tourists leave the abbey shortly before 1430. Arrangements are well under way for this years Remembrance Service. It takes place on 30th November in Westminster Abbey. Full details is in the latest newsletter (here). Everyone is welcome and we'd love to see as many people as possible. Our Autumn newsletter has been published and is available here. Roy Parker has informed me that his father George died on 23rd July. His funeral is to be held at 1100 on Wednesday 7th August and at 1215 on the same day his body will be cremated at Aldershot Crematorium. After Len Horner died in January 1989 George joined the Committee of the HMS Barham Survivors Association as its Treasurer and Archivist. 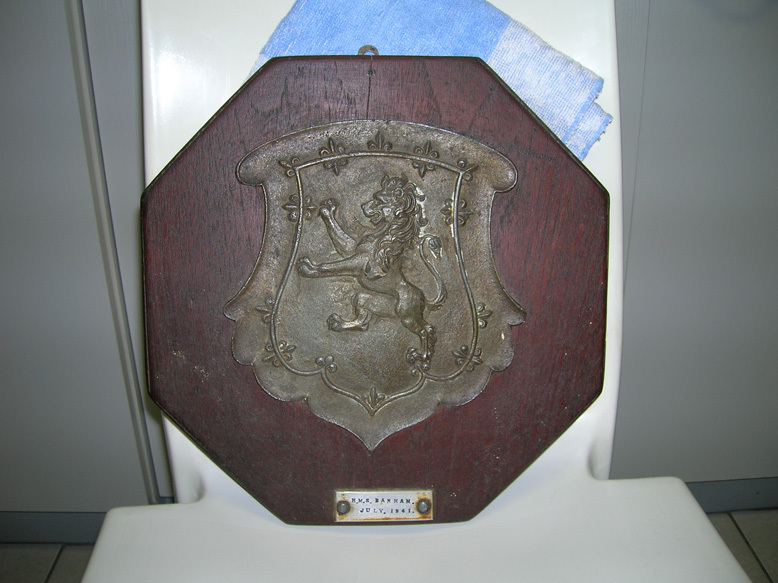 He worked with Don Young a son-in-law of survivor Bill Gidley to have the HMS Barham Survivors Association Standard made and became our first Standard Bearer after it was presented to the Association by John Groot (another of Bill�s son-in-laws) at the annual dinner on 18 May 1991. Due to ill health he resigned from the committee and as Standard Bearer in July 1996. The annual service of Remembrance was held at Westminster Abbey on Saturday, November 24th 2012. 57 attended including 2 Survivors. A wreath was laid, but as advised last year, for the first time at the Service, the Ship's Standard was not paraded. The Chairman of the Association, Michael Stratton Brown read the poem by Alfred, Lord Tennyson, "Crossing The Bar". 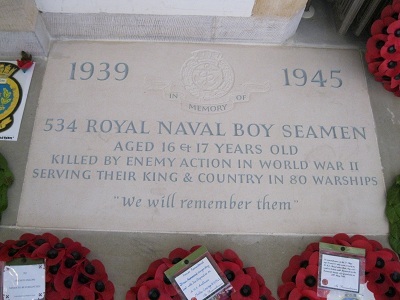 On Sunday 18 March a memorial stone was dedicated by the dean in the ambulatory of Portsmouth Cathedral to the 534 Royal Naval Boy Seamen who were killed in World War II. There is also a Book of Remembrance with all the names including the 23 Boy Seamen who were killed when HMS Barham was sunk on 25 November 1941. Maurice Key is also named but the Commonwealth War Graves Commission website and the Portsmouth War Memorial have him as an Ordinary Telegraphist aged 18. Not included is Boy Bugler George Miller Royal Marines. There are more photographs of the Remembrance book and the memorial in the photo section. Sadly a survivor, Tom Cropp who was a Petty Officer at the time of the sinking died on 4 February. A well attended funeral was held at Upham church near Bishops Waltham on the 15 February. The Association gave a wreath. The service at St Anns Church at the naval church in HM Naval Base Portsmouth was well attended by Association members. CPO Bob Woodgate paraded our Standard with great dignity and it was accepted by the Chaplin of the Fleet. I should like to thank EVERYONE who has helped to make my position as Secretary more fulfilling. My sincere thanks must go to all who attended the Remembrance Service at Westminster Abbey we had a record number os some 225 persons, which is most pleasing for all the work that goes in to make the day a great memory. I have just received notice that entry to St Anns Church is via the Trafalgar Gate. For those with SAT NAV please put in fot PRINCESS ROYAL AVENUE and follow sign to HM Dockyard. Again many many thanks to all , Hope you all have a Wonderful Christmas and a really good 2012. A big thank you to everyone who attended the service yesterday. It was great to see so many people there. As you were probably aware, there was a camera filming the service for the BBC. The programme is to be shown on Points West on BBC West. 6.30pm Sunday 28th Nov (Sky Channel 986). Click for the BBC iPlayer. A video will be posted on youtube during the coming weeks, showing the service of this important event which took place at the National Aboretum in Staffordshire, this summer. Survivors, members and guests are requested to enter Westminster Abbey by the west door no later than 1430 on Sat 26th Nov 2011 and proceed to the seating in the centre of the nave. Prior to Evensong the Abbey staff will direct us to seats in the choir stalls for the service. For people who have never been to this service I find it one of the most moving celebrations at which to be present. We're sorry to have to announce that Leslie Baker passed away on 25th September 2011. Our thoughts are with his family and his friends of the Norwich Branch of the Royal Navy Association. 14/06/2011 - Dedication Service at the National Memorial Arboretum. On Saturday 11th June 2011 some 79 persons including three survivors, Mr John Nealon, Mr Richard Laland and Mr Ted Clow attended the Service of Dedication of a memorial Stone at the National Memorial Arboretum, Alrewas, Staffordshire. The service was conducted by the Reverend Keith Robus, Chaplin of St Ann's Church, HM Dockyard Portsmouth, Keith had recently arrived back in Portsmouth after serving on board HMS Gloucester. The stone had been commissioned from Forrester Brothers of Stoke on Trent who undertook to do all groundworks at the Arboretum. The owner, Mr Harry Mouat and his wife Julia attended the service as our guests. On behalf of the members of the committee I should like to thank all who attended from all parts of the UK and sincerely hope that they all enjoyed their day. For those who have not had the opportunity to visit the NMA I suggest that it is a remakable and rewarding days outing . We look forward to meeting you all on Saturday 11th June at the National memorial Arboretumat ALREWAS Staffordshire and sincerely apologise for the late details. We're sorry to have to announce that Keith Miller passed away on 22nd April aged 60 years after many years of illness. 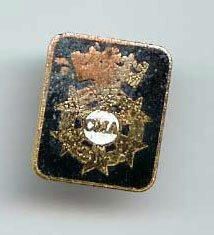 He was the Standard Bearer for a few years at Westminster Abbey for the association. �We're sad to have to announce that Dennis Kitchen passed away in his sleep last week. Our thoughts are with his family and friends. RIP. Douglas Heath from Tamworth RNA has been in touch regarding the forthcoming Dedication Service on 11th June. He's very kindly invited those attending the Service to their Association for an "Up Spirits" while in the area. Plans are well under way for the Dedication service for our Memorial Stone in the National Arboretum at Alrewas, near Lichfield, Staffordshire. The service is on 11th June 2011 at 2.00pm. We are hope for a good turnout so if you'd like to attend, please get in contact asap. The Spring 2011 Association newsletter has been posted on the website. View it here or download and read it here. 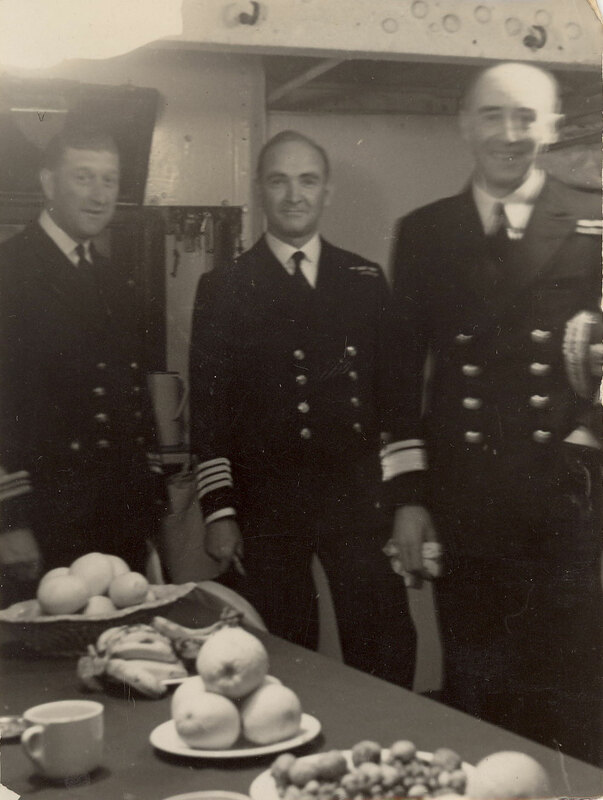 A new photo has been sent in by Mrs Elizabeth Scott, daughter of Lt Cmdr Barchard showing her father, with Captain Cooke and Admiral Pridham-Wippell. The Admiral was the only one of the three to survive the sinking. For those readers who were unable to attend the Remembrance Service in November, we've put together a video of the highlights of the Service held at Westminster Abbey on 27th November 2010. Many thanks to Sara's cousin for this. She's done a great job! Many thanks to the 114 or so people who attended the wreath laying service at Westminster Abbey today on a very cold London Afternoon. It was marvellous to see so many people and to meet a new 'Survivor' who only recently contacted or became aware of the association. He was a Mr David Stewart and it was his first time attending the service with his family. We have a few photos of the day here. Survivors, members and guests are requested to enter the Abbey by the west door no later than 1430 and proceed to the seating in the centre of the nave. The association is in the process of getting a memorial stone placed in the National Arboretum in Lichfiels, Staffordshire. We'll post the date of the dedication service once we know more. A Requiem Mass for the Lord Barham, the Earl of Gainsborough will be held on Thursday 28th January at 11.00am at the Brompton Oratory, London. Unfortunately we have to inform you that Lord Barham, the Earl of Gainsborough, our associations President, died on the 29th December 2009. The family have requested no flowers at the private interment and the date for a Requiem Mass will be posted at a later date. I personally would like to thank everyone who attended the Remembrance Service yesterday th 28th November. It is much appreciated by the committee that so many attend. Our wreath was laid by the two survivors Mr George Knott and Mr Jack Nealon and the standard paraded by CPO Bob Woodgate. "A VERY HAPPY CHRISTMAS AND A PROSPEROUS 2010"
The annual remembrance service is almost here and we've been asked my the Abbey staff to pass on a message to everyone planning on attending. All persons attending should note that they must tell the Abbey staff that they are attending the HMS Barham service, as 1500 Ukranians are also attending a special service. The Abbey staff will then direct all Association members to the correct meeting point. Regular contributor to our website Geoff Wearmouth has posted a message in our guestbook about an article printed in the Times newspaper on 23rd February 1942. 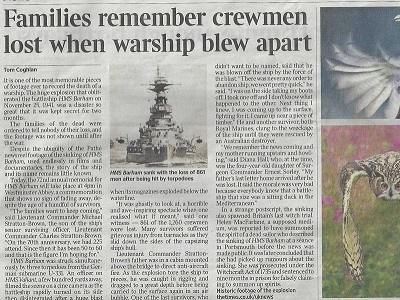 Its the article that formally announces the deaths of the crewmen lost when the Barham was sunk. You can see the scan here. 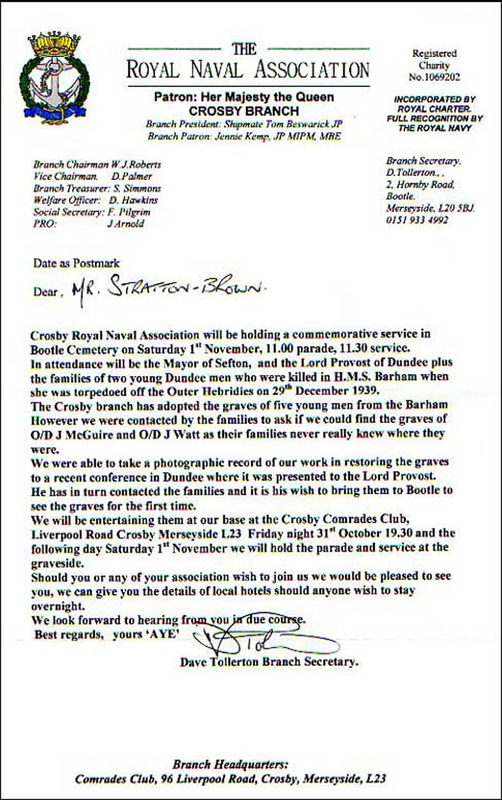 The association has recently received a letter from the Royal Naval Association regarding a commemorative service. Among those being honoured are two men who died when the Barham was torpedoed off the Hebridies in December 1939. View the letter to see more information. It is with great regret that we have to report the death of survivor Lt Commander Bryan James Samuels. He died peacefully on 2nd July 2008 in Derriford Hospital, Plymouth. Janice Clark also sent us an account written by her father John Cross, who was a survivor of the sinking. Janice Clark, daughter of survivor John Cross came across a newspaper article that we hadnt seen before. It was written some years ago by another survivor Ronald Dando. You can read it here, or view the original on our Press & Letters page. We've just received details of the funeral service for Arthur Quantrill Bryant who died on the 14th of this month. The service is at 1130 on Mon 28 Jan at All Saints Church, Cressing nr Braintree, in Essex. The MCDOA website has published a glowing tribute to Arthur on their website (publish date 19th Jan) along with many other tributes. It is with great regret that we have to report the death of ARTHUR BRYANT, a survivor of the sinking. Arthur died yesterday morning 15th Jan 2008. Details of the funeral arrangements are not yet known but will be forwarded ASAP. Arthur was a great supporter of the Association and enjoyed meeting his shipmates at the dinners and at Westminster Abbey. Sorry to be the bearer of sad news but we've just heard that Mrs Evelyn PETHERBRIDGE wife of Sidney died on the 15th December 2007 and that the funeral will take place at St Paul's Church,Winchester Hampshire on the 2nd January at 1400 Hours. Evelyn donated so many gifts to all the raffles at the reunion dinners and was a stalwart of the Association. Sidney was a telegraphist at the time of the sinking and for many years was the treasurer of the Association. She will be sadly missed by all who had the pleasure of knowing her. Martyn Smith has emailed Barham HQ with a query that we hope our readers will be able to help with. Martyn is the nephew of Harold Pressgrave Smith who was lost when the ship sunk. The only photo the family has of Harold is the one as a young boy, shown here on the left. While reading our website, Martyn spotted a photo that hes wondering if its his uncle, but unfortunately we havent got a name to go with it. The Decorations and Honours Register is now accepting registrations for the Commemorative Edition to be published in the spring of 2008. Many of our members are eligible for inclusion. Registration is free of charge and painless, either via the website www.honoursregister.co.uk or by simply sending in an individuals name, list of medals, decorations and/or honours with dates awarded, to the address shown below. The closing date for registration is 29 February 2008. Please see the press release http://www.honoursregister.co.uk/PROct07.pdf which contains all the information you should need to participate in this new reference book. 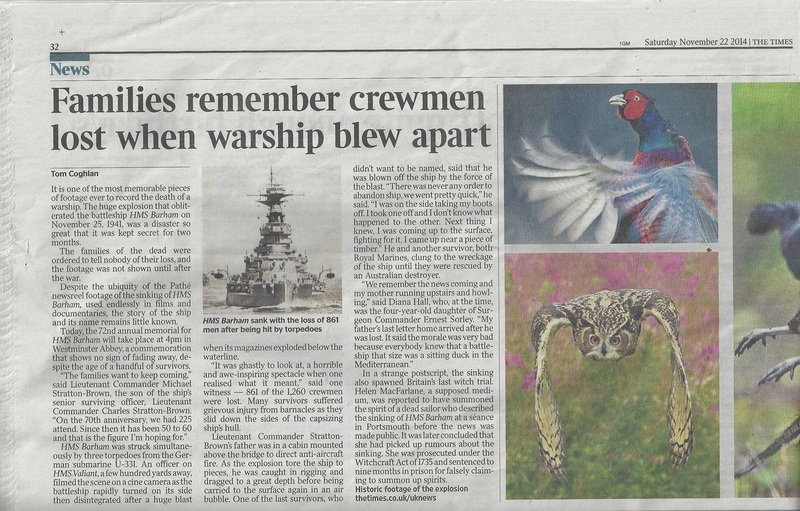 The Register has been featured in the Daily Express, the Daily Telegraph, the British Legion magazine and Medal News. Our Editor, the honours expert Charles Mosley, was recently interviewed on BBC Breakfast and SKY television. Tom Masters, son of survivor John Masters, has informed us that his father died peacefully at his home on 1st June 2007. He leaves a wife, Babs, sons Nick and Tom, four grandchildren and two great-grandchildren. There is an obituary on the Daily Telegraph 21st June, 2007. Unfortunately we've been informed of the death of another survivor. John Gale passed away on 6th June 2007 aged 87 in his home town of Kidderminster. He left a wife Vera, 5 children, 9 grandchildren and 2 great grandchildren. The funeral will take place on 15th June 2007. We recently received an email from a reader enquiring about purchasing photos from the website. Your email address has gone missing, so if it was you, can you get back in touch please. As you may have read in Geoffreys message in the guestbook, John Turner, the cameraman who filmed the sinking of the Barham died recently. You can read his obituary in the Times Online here, and in the Guardian Online here. 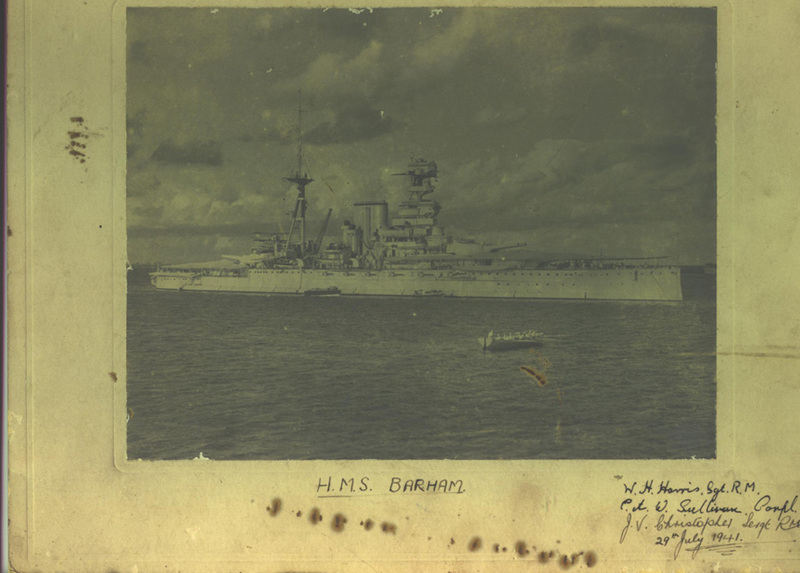 A while ago Brian Ralphs sent Barham HQ some photos of his father, Douglas, who was a survivor of the Barham sinking. Also included was an account his father had written of the day the Barham went down. Its well worth a read and we thank Brian for sending it to us. You can read it here. 02/03/2007 - We were hacked! Yep, thats right. Some time Thursday morning you may have noticed our homepage was overwritten. No other data went missing and normal service has now been restored. Thanks to everyone who emailed us alerting us of the problem. 18/02/2007 - Recognise this man? We've had an email sent to us in Barham HQ from Brian, whos wife has had this photo tucked away for many years. They dont know who it is though, or where it came from, and was wondering if any of our readers recognised the man. Has anyone any ideas? Please email us at info@hmsbarham.com. 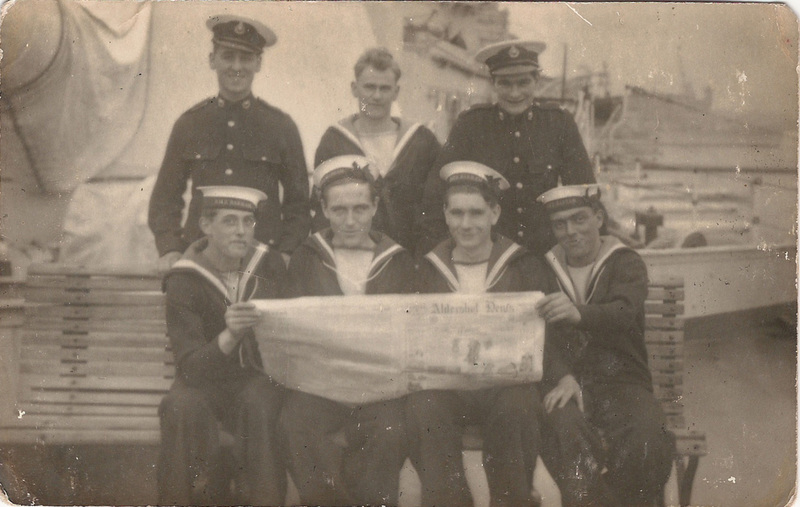 Greg Laraway has written to us: It is my sad task to inform the HMS Barham Association of the death of survivor John Laraway. He died in the QA Hospital Portsmouth on the 18 January 2007, he is survived by his wife and will be greatly missed by his children and grandchildren. The funeral will take place on 7 February. Unfortunately we've been informed of the death of another survivor. Godfrey John passed away on 19th January 2007. The association is sad to announce the death of Graeme Sorley on 23rd January in Victoria, BC, Canada from cancer of the pancreas. Graeme, aged 74 was the son of the late Surgeon Commander E.R. Sorley who was lost in the sinking of the Barham. Graeme was the first person to sign the guestbook of the Barham website when it began in 1999 and has become something of an expert on the ship and all matters connected to it. He was also part of the memorial voyage (here) to the site of the sinking which took place in 2003 in which a wreath from the Barham Association was placed on the water. He contributed very substantially to the BBC's website the People's War (here) with his own memories of life as a boy in the war years, as well as faithfully transcribing many of the hand written letters written from his father to his mother, Mrs. Joan Sorley, prior to the sinking. He devoted a huge amount of time and energy making these letters available to future generations and historians. He is a great loss to his family and friends. We've added a write up of the Memorial service held in Westminster Abbey to the site. It can be found here. There are also some photos courtesy of Josh Millais. We'd like to wish all our readers a Merry Christmas and a prosperous 2007. Im sorry to have to pass on the news that survivor Keith Bennett passed away on Wednesday 20th December. His funeral is being held on 5th January 2007 in St. Marys Ashwell, Hertfordshire. David and his family are in our thoughts. After a number of requests, ive posted a copy of the poem that Reverend Jeremy Bradford so movingly read at this years service in Westminster Abbey, online. We're not sure of the author so if anyone can enlighten us, please email. The poem can be found here. This is just a quick post to thank everyone who attended the memorial service on Saturday. It was a lovely afternoon and a very moving service. It was especially nice to see survivors Arther, John and George there. We'll post a more detailed report in a few days, along with some photos and copies of the readings. We were handed this pin after the service on Saturday. It was found in the area where we were sitting. Does anyone recognise it? It can be claimed by emailing us at info@hmsbarham.com. The details for the Memorial Service on the 25th November are as follows: Meet at the West Door of Westminster Abbey at 2.30pm to be seated in the nave by 2.45pm. The main service starts will start at 3pm and last for about 45 minutes. We'll have our own service at 4pm, with a minutes silence at 4.30pm, exactly 65 years to the day when the ship sank. Hope you see you all there! We've been sent a new photo of the ship which shows the crew in all their glory. Thanks to P Griffin, Grand Nephew of survivor Thomas Paffett for contacting us. This years memorial service is fast approaching so nows the time to start planning. More details can be found in the last newsletter. There are also stories and photos from previous services in the 'Memorials' section on the left menu. You may have noticed a few blank screens and a couple of hiccups on the website over the last day or so. Ive been moving all my work to a new hosting company so it took a while to copy all the files and photos over, and to rebuild the database that runs the site (the website is weighing in at around 120meg now!!). Everything should be back to normal again now. Please let me know if you notice anything strange. Is it me, or does there seem to be a lot of Barham experts reading the Daily Mail? The replies have all got some very interesting information regarding the ship, whether it be personal or as a hobby. If youd like to write something for the website and put your knowledge in print so that its saved for generations to come, we have a plenty of webspace to publish it and plenty readers waiting to read it. Heres an open invitation. Give it a thought and email us at info@hmsbarham.com. While im posting, we're also very keen to get photos of the past crew. We currently have pictures of 72 of the crew members - we'd really like that number to grow! So if youre one of the 117 people who have recently added themselves as a contact to a crew member, or one of the 158 people who have updated crew information, please have a dig around for any photos you may have. We promise to return any sent via post. Another article printed in the Daily Mail regarding the Barham. You can see all the articles by clicking here. 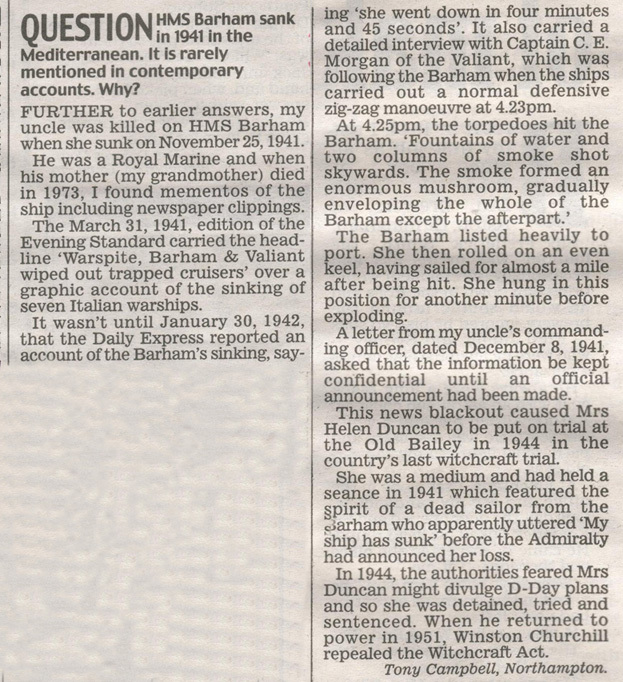 Heres another article printed in the Daily Mail regarding the Barham. You can see all the articles by clicking here. Its been just over six months since the website relaunched with the new domain name and the new look. We get emails whenever there is an update to crew information or there is a new message added to the guestbook so we know that the site is doing quite well, but it wasnt until i did a bit of digging around in the deepest depths of our database tonight, that the figures hit home. They made me smile, so i thought id share some of them. and 68.57% of the visitors are brand new visitors to the site. So on a personal note from all our editors, journos, roving reporters, photographers and programmers at Barham HQ, we'd like to say a huge thank you to all of our many readers and contributors for making this not only a website, but a community too, to make sure that the memories of the Barham wont be lost. We received an email today from Charlotte Clark who found this photo amongst some family papers. Shes trying to do some research on her family and believes she may be related to Clarkes who were on the ship. Can any of our readers help put names to the faces? Or maybe know what the significance of the paper they are holding? Answers on a postcard please, or in an email to us at info@hmsbarham.com. Unfortunately we heard the news that another survivor has passed away. George Sweetingham died on 3rd June. We extend our sympathies to his family. We're very sad to have to announce the death of survivor Derek Allaway. He passed away 4th September 2006 in Spain where he lived for the last 25 years. Our sympathies go to his wife Anne, and the rest of the family. We've had an email from Jack Nealons family recently regarding an envelope mislaid at the Barham reunion this May in Portsmouth. The envelope contained photos and other personal papers so obviously these are of huge sentimental value to Jack and his family. If anyone picked them up by mistake, please get in touch with us here and we can pass on the message. Our email address is info@hmsbarham.com. As you know, we love receiving your emails at Barham HQ, and so we were particulary pleased to receive one from Clive Talbot from South Africa out of the blue. 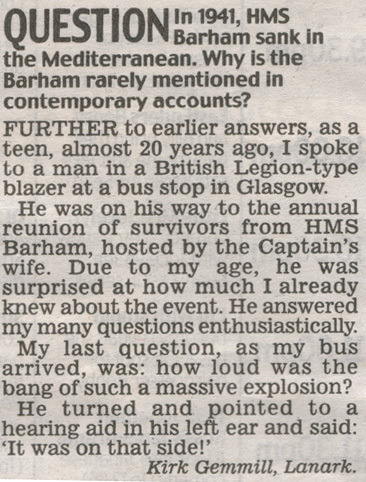 He has some fabulous memories of meeting some of the Barham crew in 1941 while the ship was docked in Durban. The picture above hung on Clives bedroom wall while he was a child. Clive has let us share his email here. September is always a busy month for us here at Barham HQ. As regular visitors to the site will know, November is a newsletter month so there has been many a sleepless night spent writing and compiling the Associations newsletter. You can download a free online version of the newsletter by clicking here. We're always interested in your views and comments so please forward them all to info@hmsbarham.com. There seems to be a few Daily Mail readers visiting the site recently, and also a few Barham experts reading the Daily Mail. Heres another follow up to a Barham related question published on 12th August. Click here to see the latest article. As in previous years, the associations annual memorial servive will be held in Westminster Abbey, London. This year it will be held on Saturday 25th Novemeber, 2006. Accounts and photos of other services can be found here. Writing Septembers newsletter is now well under way. As we speak the typewriters are being worked overtime and the writers are burning the midnight oil. If anyone has anything they'd like to have included, we can be reached at the usual email address. All contributions would be gratefully received. The newsletter should be available in the next few weeks. Check back soon for more details. 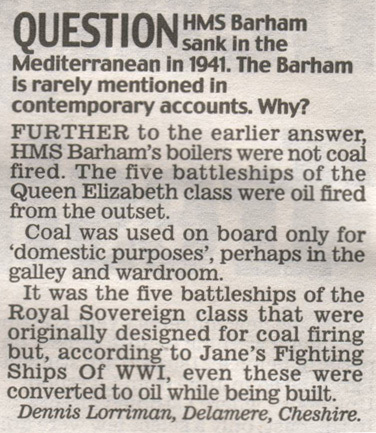 After the question published in the Daily Mail on the 12/08/2006 (see below) wondering why the Barham isnt mentioned in accounts of the war very often, there was an answer sent in by a Mr Cubitt from Northampton. Either way, its nice to see that the Barham can still make the papers after all this time. Dave Wolfson from South Africa has been in touch with us here at Barham HQ with a query for our readers. 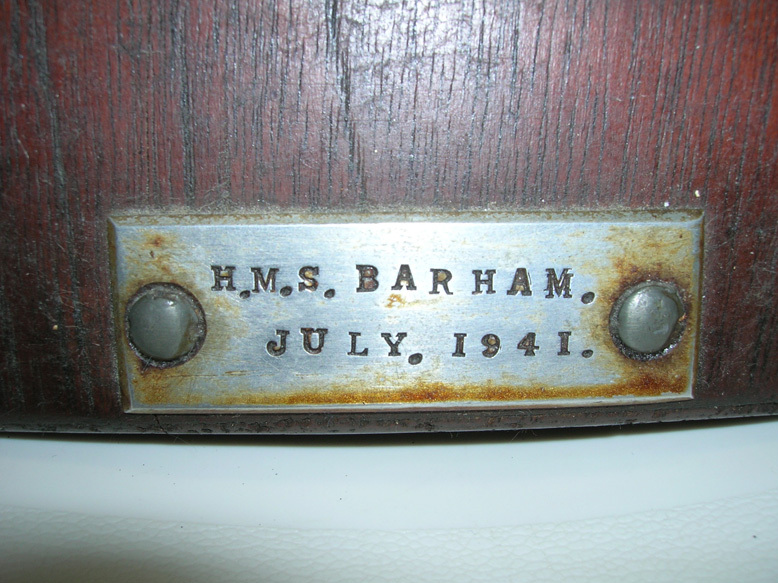 His grandfather gave him a plaque bearing the Barham emblem and entitled 'HMS Barham July 1941', and he's trying to find out its history. 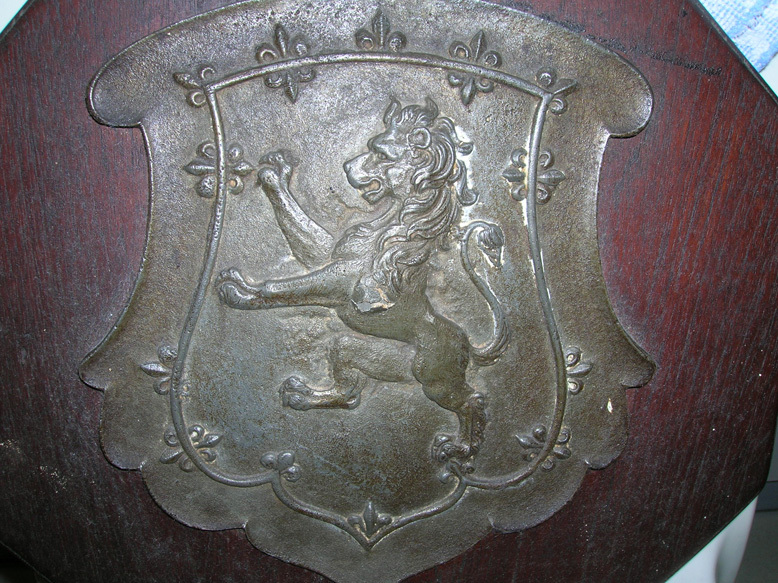 It's cast in steel and is mounted on wood and he was told that it came from the ship itself. Does anyone out there recognise it, or have any idea whether its original or not? He would be very grateful if anyone could shed any light as to its history. Email us at info@hmsbarham.com with any infomation. A reader of the website spotted this question in todays Daily Mail newspaper. 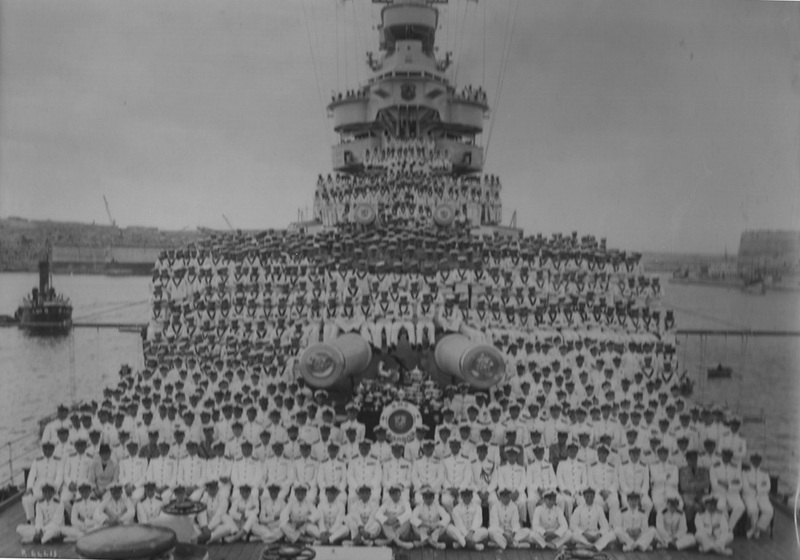 "HMS Barham sank in the Mediterranean in 1941. The Barham is rarely mentioned in contemporary accounts. Why?" Maybe someone might like to suggest an answer! Email us at info@hmsbarham.com and i'll post answers here. An obituary to Douglas 'Ginger' Lynd who passed away in May is published in todays Daily Telegraph. An online version can be read here. 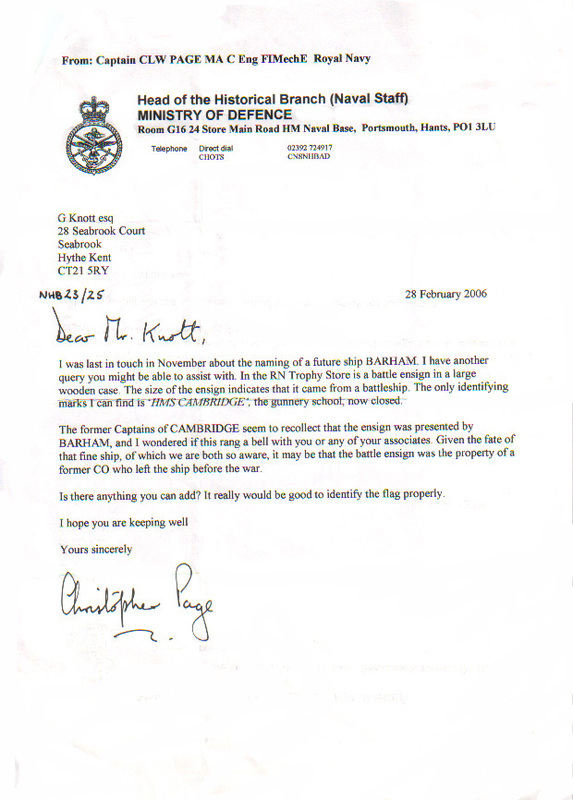 Survivor George Knott has received a letter from the Historical Branch of the Minitry of Defence regarding a battle ensign found in the Royal Naval Trophy store. If anyone can throw any light on this find, or know where it might have came from, its the usual address please.. info@hmsbarham.com. Derick Potts, a member of the association, and whos brother was lost when the ship sank, has been in contact with us here at Barham HQ to inform us of the sad news that his wife Irene passed away on 27th January 2006. Again, our thoughts are with their family. 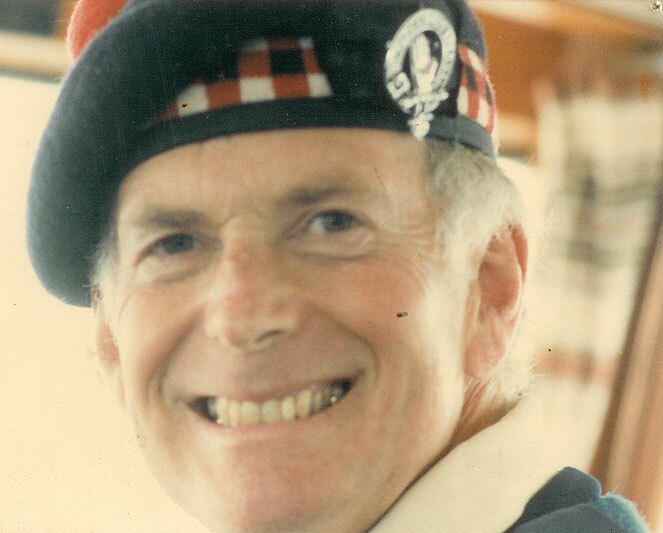 As you may have read in the guestbook, Mike Lynd has informed us of the sad news that his father, Lieutenant Commander Douglas Lynd, RN, MBE, a survivor of the sinking, passed away on 20th May 2006 at the age of 84. His funeral is taking place at Eastbourne Crematorium on Monday 5th June 2006. Mike also has a site with more Barham information and lots of photos here. Its well worth a look. Jim Samuels has sent in a photo taken at the reunion this month. Four of the survivors are sitting in the front row. Thanks Jim. Please include us on any other photos being shared. As always, our email address is info@hmsbarham.com. 18/05/2006 - Reunion dinner - what a success! The Association held its final reunion dinner in the Royal Sailors Home Club, Portsmouth on Saturday 13th May. It was a resounding success with 118 attending, including 9 Survivors. A huge thanks to all the organisers and attendees. A report and some photos can be found here. If anyone has any other photos taken at the reunion, and would like them put on the website, email them to us at info@hmsbarham.com. 02/05/2006 - Can you help? This community will only continue to grow with your input. We are always on the look out for any Barham-related photos, either old or new. Photos of crew members are expecially welcome, as are any stories and memories you may have regarding the ship and its crew. Please email them to info@hmsbarham.com. If you havent access to a scanner you can always send them to us via post. Again, please email us at info@hmsbarham.com for an address. We promise to return all photos. As you know, the 50th annual reunion is almost upon us and what a celebration it is promising to be. So far over 110 tickets have been sold, with people flying in from as far afield as Canada to attend. Details can be found in April's newsletter (see here), and anyone still wanting tickets or any other information should get in contact with one of the names on the About Us page. But hurry - we are almost at full capacity and are already organising extra accommodation! We are sad to hear that survivor George Oliver, a regular at our reunions and a member of the Royal Naval Association died on 19th November 2005 after a short illness. His funeral was held on 28th November 2005 at Southend Crematorium. Mick represented the Association with the Barham standard. This matter brought to our attention by Anne Randall of the Dunedin Society. She writes, "I am a researcher for the Dunedin Society and wonder if you could put me in touch with someone in your Association who might know about the damage to personal plaques at the War Memorial, Southsea Common. As you will know, Hood, Dunedin, and so shortly after Barham, were the main ships lost in 1941, and it is under these panels that most of the personal memorials have been vandalised. We had 2 badly smashed and there are 7 altogether. Very upsetting for the families concerned. To bring such desecration to the public notice, our PRO, Michael Gill, is doing an article for the Portsmouth Evening News, who are keen to run it, and also it will go in Navy News. I have already been in touch with Paul Bevand of the Hood Association and they were not aware of the situation but would like to help by being involved. So I wondered if you would like to incorporate Barham's name too when you have more details. The damage has only occurred during this last year. I have contacted Roger Young of the P. City Council parks dept. who are responsible to the CWGC for the upkeep, and they do know of the vandalism, and other damage to memorials in the area." Matt Blair has been offered a cap for sale - he writes, "Can I ask your opinion on whether it looks authentic or not?" See pic and click link on his name to email him. We have heard the sad news that Sidney Petherbridge, a survivor who made a great contribution to the Association died on 12th December 2005. His funeral is to be held on January 3rd, at 12pm at St Paul's church, Winchester. Geoge Elliot, stoker, founder member and past Chairman of the HMS Barham Association died 4th October 2005. George was an inspiration to the Association as well as a man determined to keep alive the memory of the ship mates he lost when Barham sank. He had been ill for some time and last attended an Association meeting in August 2004. We've added a new page to the site concerning the sinking of the HMS Duchess by the Barham on 12th December 1939, off the Mull Of Kintyre. Read about it here. A new page has been added about the Barhams role in the Battle of Matapan in March 1941. Read about it here. Paintings done by Mick Tapsell, son of a survivor are now available for �5.00 including p&p contact webmaster for more details or call (+ 44) 01306 640841. You can see both the pictures here.